While parkgoers are not worried about hitting the beach at East Coast Park after a crocodile was sighted there, parents of young sailors feel events around the area should be cancelled for now. The reptile was spotted on Monday at a construction site next to the National Sailing Centre at East Coast Park, prompting the centre to suspend all water activities until further notice, a spokesman said yesterday. But parkgoer Alan Leong, 45, who was setting up camp next to the centre yesterday, was not worried. The operations manager said: "The crocodile could just be passing by... When in the water, people should just take precautions and not stay in for extended periods of time." Student Putera Aiman Roslan, 17, was more cautious. "I am not worried about the crocodile unless I have to go into the water, which I don't plan to do today," he said. A parent, who declined to be named, said all water activities should be suspended until the crocodile is caught and relocated. 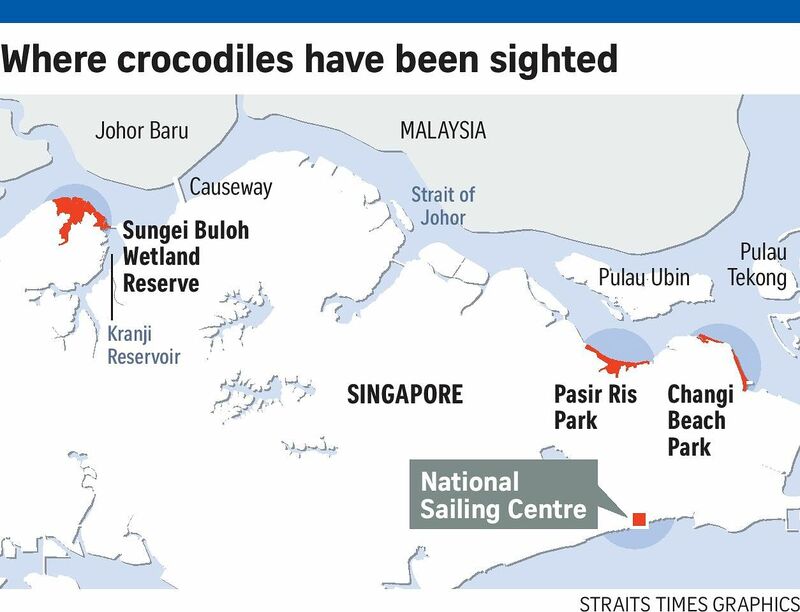 He also said a regatta organised by the Changi Sailing Club, due to be held at the end of this month near where crocodiles were seen in August, should be cancelled as well. "Or if they are adamant on having a regatta, then reclassify it as a non-ranking regatta so parents won't be pressurised to (let their children) participate," he added. The latest sighting is believed to be one of the first reported ones of the reptile in the Singapore Strait south of the mainland. Crocodiles have been seen in the Johor Strait along the northern coast, mainly in Sungei Buloh Wetland Reserve. But in August, there were also sightings of them at Pasir Ris Park and Changi Beach Park, leading the authorities to put up signboards. The National Parks Board (NParks) and the Agri-Food and Veterinary Authority said then that they would monitor and try to relocate the crocodiles. However, The Straits Times understands that no further sightings have been reported in the areas since. Dr Adrian Loo, NParks' acting group director for conservation, said the board will, upon receiving reports of crocodile sightings in areas managed under them, monitor the area to verify the presence and location of the crocodile. "For public safety, we will plan to catch and translocate the crocodile if sightings are made at areas where water activities take place frequently and there is potential impact on recreational uses. Concurrently, we will put up advisory signs near the water's edge and advise operators of establishments along the coast to take the necessary precautions. Park staff on regular patrols will also advise visitors venturing close to the water's edge." Nature guide Ivan Kwan believes the previous sightings at Pasir Ris and Changi may involve one individual that has now made its way to East Coast. "Or they could be different individuals dispersing from Johor, where mangroves are being destroyed, forcing crocodiles to seek new homes." He noted that the estuarine crocodile is territorial, so these animals could be showing up in Singapore waters due to a combination of factors, such as the loss of mangrove habitats in the eastern Johor Strait, or that available territories are being occupied by older, larger crocodiles. Mr Stephen Beng, chairman of the marine conservation group of the Nature Society (Singapore), advised people to be careful when around estuarine crocodile habitats, and to heed warning signs. "We need to study their ecology and population. We also need education and management programmes to mitigate conflict," he said.